Great Cool and Cold Weather Fishing in New York’s Niagara River Area. Bud Cole with a nice size steelhead caught on the Niagara River. Fall is the season for many scheduled events such as football games and Oktoberfests as well as unscheduled event like hunting, raking leaves and enjoying the autumn colors and weather. But fall and the milder days of winter can also provide fantastic fishing opportunities. My wife Bev and I took a recent trip to the Niagara Falls area of New York to do some touring and to participate in some fabulous fall fishing experiences. We contacted Bill Hilts Jr., the Outdoor Sports Specialist at the Niagara Tourism and Convention Corporation, to get some tips on fishing guides, lodging and tours in the area. 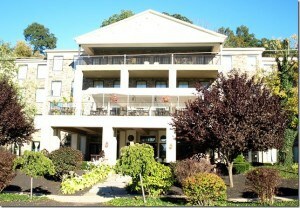 He recommended the Barton Hill Hotel and Spa in Lewiston, New York. The hotel is conveniently located overlooking the Niagara River in Lewiston. Check www.bartonhill.com. Contact Bill Hilts Jr. at 716-282-8992, Ext. 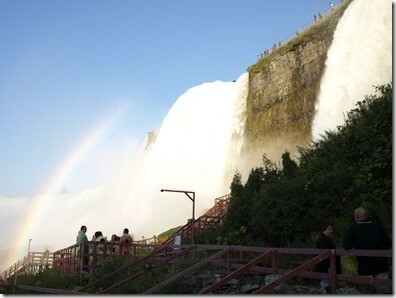 303 orBill@Niagara-USA.com. Lewiston is a quaint town located along the banks of the Niagara River. 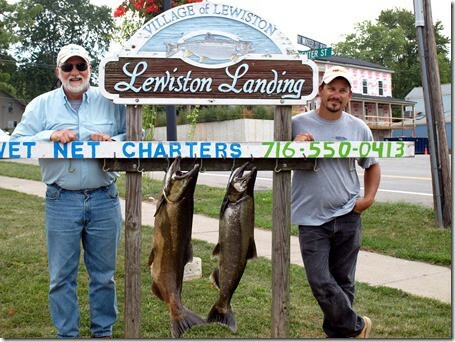 You don’t have to be a fisherperson to enjoy Lewiston, although the outstanding fishing draws fishing enthusiasts from near and far. The small, but vibrant village is home to some outstanding restaurants. The village is also steeped in early New York history and it’s known as the last stop to freedom on the Underground Railroad, the network of secret routes and safe houses used by 19thCentury black slaves to escape to the northern free states and Canada. There is a beautiful statue dedicated to the Underground Railroad in the park located between the Niagara River and the Barton Hill Hotel. 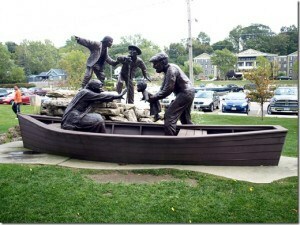 The monument to the Underground Railroad in Lewiston, New York. Hilts also put Bev and me in contact with some excellent fishing guides. We arrived at the Barton Hill Hotel on a Tuesday and began fishing the next morning with Captain Steve Drabczyk of Drab6 Fishing Charters. Captain Steve has a 2008, 19 feet Deep V Crestliner boat, powered by a 115 horsepower Mercury outboard engine, fish and depth finders and GPS. The bow mounted electric trolling motor controls the drifts as you float downstream in search of trophy salmon, walleye, smallmouth bass and steelhead. All equipment including bait and tackle is provided. If you are not practicing catch and release Captain Steve will clean and package your fish at no extra charge after the trip. We met Captain Steve at 7:00 a.m. at the Lewiston public boat ramp located conveniently about 300 yards from the front door of our hotel. Minutes later we were fishing about two miles upstream from the ramp. Several small king salmon were caught and released during the first hour. Bev caught a 22 pound king salmon using salmon egg skein around 11:00 a.m. Our method for catching the salmon was drifting with the current while Captain Steve kept the boat in line with the drift using the trolling motor. We used bait caster reels with star drags and a stiff rod. The main line was tied to the swivel with a six ounce weight to a circle hook tied to a two feet leader Once we reached the end of the drift, near one of the many hydroelectric power plants located along the river, Captain Steve pulled up the trolling motor as we reeled in our lines. The 115 Mercury soon had us at the top of the drift once more. For more information contact Captain Steve Drabczyk at 716-807-6248 or Drab6221@verizon.net. 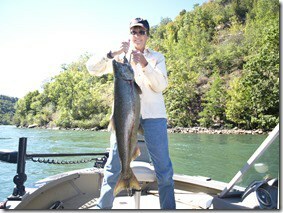 Bev Cole with a 22 pound king salmon. Bud Cole and Captain Steve Drabczyk with Bud’s 42 inch 30 pound king. I had caught several throw back kings, but nothing to write home about. The last drift of the day had arrived and the pressure was on. We had drifted about 30 yards when my line went taut, the reel drag began singing and the battle was on between man and fish. About 10 minutes later the Captain Steve netted my 30 pound 42 inch king salmon. Day one’s fishing adventure was coming to a close. Minutes later we were back at the Lewiston boat ramp heading to the fish cleaning station. It was a great half day of fishing with Captain Steve Drabczyk on the Niagara River. Bev and I spent the rest of the day relaxing at the hotel. An excellent late dinner in the hotel dining room along with a bottle of my homemade Cabernet Sauvignon topped off a perfect day. Day two of our fishing venture found us meeting Captain Matt Yablonsky, of Wet Net Charters, at the public boat launch in Fort Niagara State Park next to the quaint village of Youngstown, New York. Captain Matt fishes from a 21 feet Lund, Baron Deep V fishing boat outfitted with all the necessary fishing equipment. Captain Matt focuses his charters on the lower eight miles of the Niagara River, Lake Ontario and Lake Erie. This is another great reason to fish the Niagara area of New York due to its proximity to the river and the two lakes. All three fishing areas are within about a 45 minute drive. The Niagara River serves as a conduit connecting the two Great Lakes. The lower Niagara River is considered one of the best winter fisheries in the world. We were targeting smallmouth bass with Captain Matt. Our method of choice was to drift from the mouth of the river out about a half mile into Lake Ontario. Bev was using minnows while I alternated between minnows and jigs with brown and black skirts and tails resembling a crayfish. This combination proved to be quite successful. We caught 60 plus smallmouth bass ranging from one to six pounds during our time with Captain Matt. Wet Net Charters fishes year round. Call Captain Matt at 716-550-0413. 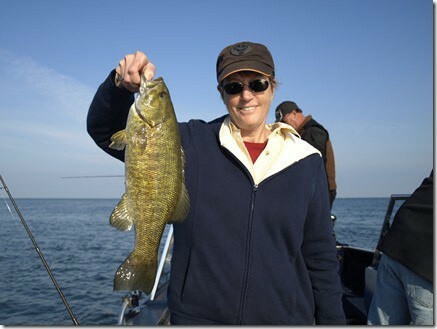 Bev Cole holding a five pound smallmouth bass aboard the Wet Net Charter. Bev and I spent the rest of the day touring Niagara Falls. We were just in time to take the last Maid of the Mist tour to the falls. The wind sent the spray across the boat. The rain ponchos provided before the ride and included with our tour fee were definitely necessary to remain somewhat dry. Bev went up to the second deck and I worked my way to the bow for photos. I had to constantly wipe my lens and place my Olympus camera under the rain poncho to keep it dry. 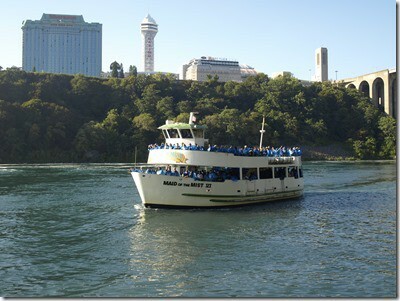 One of the Maid of the Mist fleet heading toward the falls. A view of Niagara Falls from the Cave of the Winds boardwalk. After the Maid of the Mist tour we headed by tour trolley to the Cave of the Winds. This tour takes you by elevator to the base area at the bottom of the falls. Here again guests are provided with rain ponchos for staying dry. Each guest also receives a pair of Velcro strap sandals to change into from your street shoes. Guests carry their shoes in a plastic bag while they explore the lower level of the falls. We were surprised to learn that the Cave of the Winds’ boardwalks and stairways are taken apart and rebuilt each season. A crew disassembles the walkways before the winter sets in and constructs them again in spring. The wind continued to send the spray from the falls in all directions. Our pants below the ponchos and our sandals were drenched. A few young and spirited tourists went to the far corner of the one deck where water cascaded from an outcrop above showering the brave souls with plenty of water. Back at the top you could easily tell the tourists that were under the heavy spray because their hair and clothes were soaked. We headed back to Lewiston were we had dinner at the Apple Granny Restaurant. The building constructed in 1830 has a varied menu with reasonable prices. I met Captain Matt the next morning at the Lewiston boat ramp for my third day of fishing. We drift fished in the same area as with Captain Steve. I caught several kings keeping two measuring 38 and 40 inches. Captain Matt used the same methods for the kings. We drifted with salmon egg skein. I highly recommend taking a trip to Niagara Falls area of New York to experience this fabulous fishery and remember it is one of the best winter fishing spots in the world. Steelheads are beginning to migrate up the Niagara River . 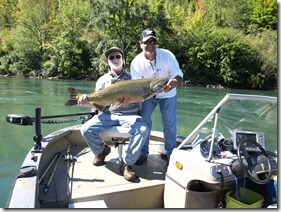 Bud Cole and Captain/guide Matt Yablonsky with two king salmon. very nice Bud, It was a pleasure to spend the day with you guys. We must do it again soon. LETS GO FISHIN!! !